In search of compost, inspiration and a good lunch, I dropped in on this food festival in Bundanoon on my way back from Canberra last weekend. I found all three. Set in the abundant community garden of the Quest for Life Foundation, the festival aims to celebrate and promote locally grown produce and sustainable, community based food production. It was very like a farmers’ market, only with more educational opportunities, like workshops on seed saving and beekeeping . 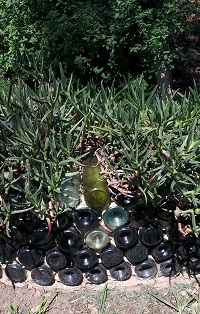 I spotted two good ideas within minutes of my arrival: a retaining wall made of wine bottles and an eco-friendly method for repelling cabbage moths. Apparently the moths won’t lay their eggs on foliage that’s protected by white balls on sticks. It seems like a great idea, but I couldn’t see much evidence of it working, there were plenty of moths fluttering around. My next stop was Curly’s Compost. Unappetising bags of the compost’s raw ingredients, sawdust, cow and turkey poo were on display, along with the final product – a rich, crumbly and surprisingly not very smelly soil. At $4 for a 20 kilo bag, I didn’t think I could find a better price for much needed manure to enrich the Broughton garden.